Embezzlement is theft. While embezzlement is a serious theft crime, because it is typically surreptitious and non-violent, misappropriation is considered a white-collar crime. Embezzlement is illegal under both federal law and the laws of Washington State, and depending on the precise circumstances of a case, several different embezzlement charges are available to prosecutors. If you happen to be convicted of misappropriation charges in Washington state, the penalties can be quite harsh, but if you’re arrested and charged with embezzlement, it doesn’t mean that you’ll be convicted. Many who are charged are either falsely accused or the victims of a misunderstanding. 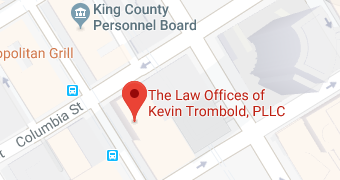 If you are charged with criminal embezzlement around the Seattle area, immediately call the Law Offices of Kevin Trombold. For over twenty years, knowledgeable Seattle embezzlement attorney Kevin Trombold has defended scores of Seattle-area clients accused of white-collar crimes including fraud, forgery, and embezzlement. Although misappropriation is a type of theft, there is one main distinction between the two crimes. To be charged with embezzlement, you must have been authorized to have physical possession over the stolen property. That’s why people who hold positions of trust are so often charged with misappropriation. Others trust them to hold onto their assets, and then the assets are misused. However, to be charged with theft, you must obtain possession of the stolen property in an illegal manner and without the owner’s consent. In a successful embezzlement defense, a criminal defense attorney only needs to cast doubt on one of these four elements. If you are charged with misappropriation, you may have made an honest mistake, someone may be trying to “frame” you, or the charge itself may be entirely fabricated. Anyone who routinely manages large sums knows how easy it can be to make a mistake. Accountants and bookkeepers make mistakes all of the time – it doesn’t make them embezzlers. Still, if you are accused of embezzlement, you need to know that the penalties can be severe and may include a prison sentence. Protect yourself. Don’t plead guilty to an misappropriation charge, don’t try to act as your own lawyer, and don’t accept any plea deal before consulting an attorney. If you’ve been wrongly accused, experienced Seattle embezzlement attorney Kevin Trombold will explain the misunderstanding and fight to clear your name. Defense lawyer Kevin Trombold also negotiates settlements with employers that allow some defendants suspected of embezzlement to avoid criminal charges. Embezzlement is punished based on the value of the property that was stolen. The greater the amount of the property, the more severe the consequences may be. If you are convicted of embezzlement, you may face both prison time and fines, depending on your prior criminal record and the details of your crime. For money or property valued at over $5,000, you may face a fine of up to $20,000 and ten years in prison. For money or property valued between the amounts of $750 and $5,000, you may face up to five years in prison and a fine of up to $10,000. Finally, for property valued at less than $750, you could face a fine up to $5,000 and up to one year in jail. Many people who are accused of misappropriation also face other charges of fraud or other white collar crimes. Each crime carries separate penalties and will increase the sentence that you may face. If you have a conviction of misappropriation, these legal consequences may not be the only ones that you face. It is common for the victims to file a lawsuit against the defendant in civil court. That means you could face prison time, fines and the possibility that you would need to pay the victim damages in civil court. An embezzlement conviction will also follow you for years to come. Many employers are hesitant to hire someone with any kind of theft charges on their record. Therefore, it may be hard for you to find an employer who is willing to take a chance on someone with a record of embezzlement. If you receive a charge of embezzlement, contact a knowledgeable Seattle misappropriation attorney promptly. If you face an embezzlement charge, hand your case over to an experienced criminal defense lawyer. An embezzlement charge can ruin your reputation if you don’t get the proper help from the correct criminal defense lawyer. Our team of legal experts can help you with your case so you can receive the most ideal outcome. Call us at 206-382-9200 promptly for a consultation.